Since the last post, we’ve established that everyone has a personal space surrounding his/her body. 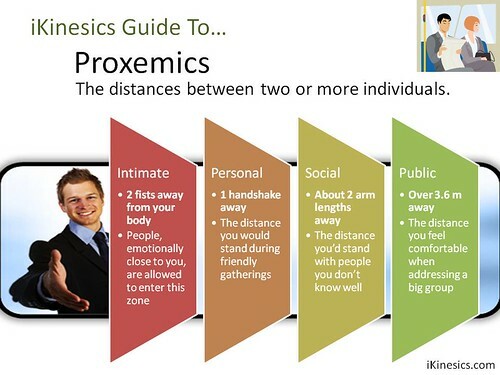 This study of territorial space is called proxemics. This zone is reserved for the people who are emotionally close to an individual. They include parents, children and close friends. This is the distance you’re comfortable with people during parties and gatherings. This distance is maintained with people you don’t know or don’t know well. When talking to an audience or large group of people, you feel less anxiety at this distance. The most critical of all the zones is the Intimate Zone. An individual will guard this zone most intensely. When it is intruded upon, many physiological responses occur. Adrenalin races through the bloodstream and prepares the individual for a fight or flight response. Three reasons exist for intrusion of the Intimate Zone. Intrusion sometimes occur when in crowded places. One has no choice but to tolerate undeliberate intrusion.